Digi-Schlock: SOUTHERN COMFORT (Shout! Factory Blu-Ray/DVD Combo) – Schlockmania! Though their sublabel Scream Factory gets most of the rapturous press, Shout! Factory also does a lot of fine work rescuing cult classics of the non-horror variety from home video oblivion. For example, they do well by action films: they’ve done nice releases of titles like Rio Conchos, The Last Hard Men and Electra Glide In Blue. They just racked up a real feather for their guy-movies cap with a new blu-ray/DVD edition of the Walter Hill cult favorite Southern Comfort. It does well by a challenging home video title and even throws in a few extras. 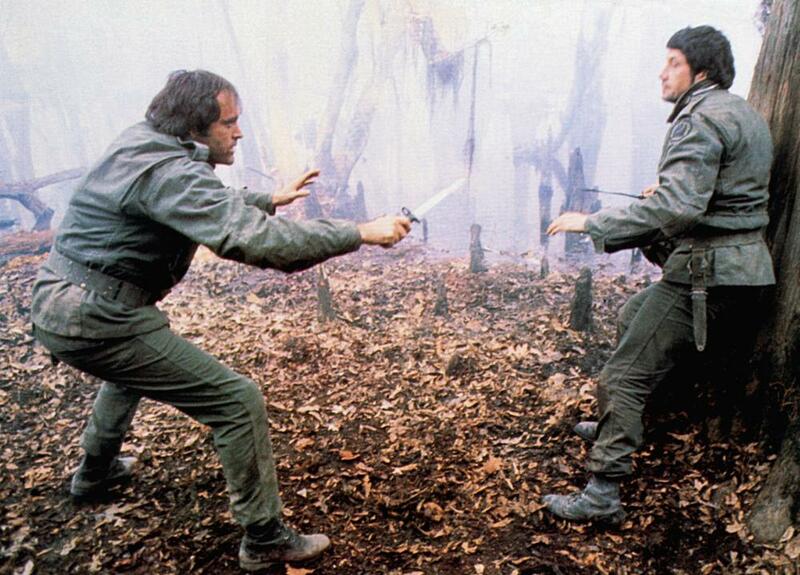 Southern Comfort has always looked a little muddy on home video: most of it was shot outdoors with minimal manipulation of lighting so past video renderings have often seemed grainy and muted in terms of color. The HD transfer used here does well by the film, working within its limits to deliver new levels of detail and a depth of color. Grain is always manageable, reflecting the gritty shooting conditions, and the result is an improvement on past U.S. video versions. The mono audio track is used with this transfer, presented in lossless form on the blu-ray and it sounds pretty decent: on a few occasions, the mix can get a little chaotic in its layering of sound effects and dialogue but this seems to be a reflection of the original recording. Most of what you hear sounds good, particularly the down-home musical score from Ry Cooder. Shout! Factory has also included a few extras. On the small-scale side of things, there is a theatrical trailer that simplifies the film to a conventional survival thriller to sell it to a mass audience, and an image gallery with a little over forty images. In addition to stills, the gallery includes a few lobby cards and two versions of a poster. The most interesting image depicts the crew standing knee-deep in water, reminding you that they had to be as dedicated as the actors to suffer in a swamp for an entire film shoot. 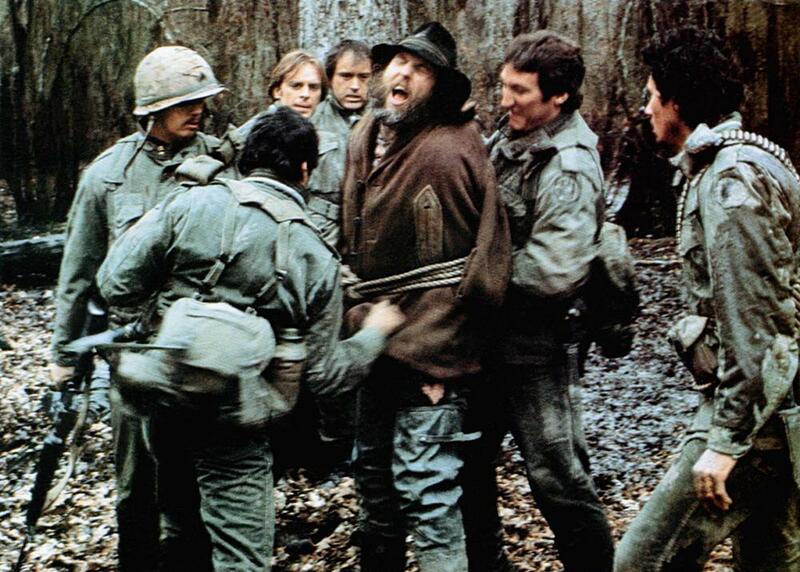 The most substantial of the extras is the best of the bunch: it’s a nearly half-hour retrospective interview featurette about the film that includes actors Keith Carradine, Powers Boothe, Peter Coyote and Lewis Smith plus co-writer David Giler and writer/director Walter Hill (the latter two appear via Skype, matted into the featurette as a picture within a picture). The result is both entertaining and informative as everyone has interesting thoughts to offer about the film. Carradine emerges as the star of the piece, offering interesting musings on the ambiguous nature of the protagonists and a thoughtful analysis of how the film presents and critiques different aspects of the male persona through its characters. Elsewhere, Hill reluctantly addresses the film’s “Vietnam allegory” angle, Coyote talks about how he challenged Hill on the subject of aestheticizing violence and Smith tells a great/scary story about the dog attack scene (Coyote also adds a memorable, hilarious anecdote about the dogs’ trainer). You’ll also learn about why they shot in cold weather conditions and how the challenges of shooting outdoors resulted in a sparsely rehearsed performance style. In short, there’s lots of great material here and it breezes by at a nice clip. In short, Shout! Factory has racked up another strong release for action fans. If you have any interest in Hill’s work, this edition of Southern Comfort is well worth the purchase. 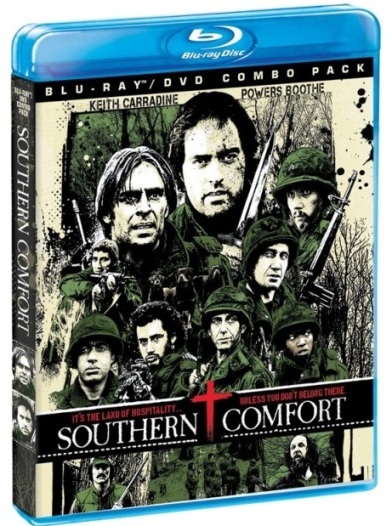 To read Schlockmania’s film review for Southern Comfort, click here.